I've joined a group of creative bloggers to bring you a monthly challenge blog hop. On the 2nd Monday of each month we share our themed creations for the month, like Upcycling, Family Recipes or Dollar Store Crafts. For February, it's the awesome Destash Challenge! 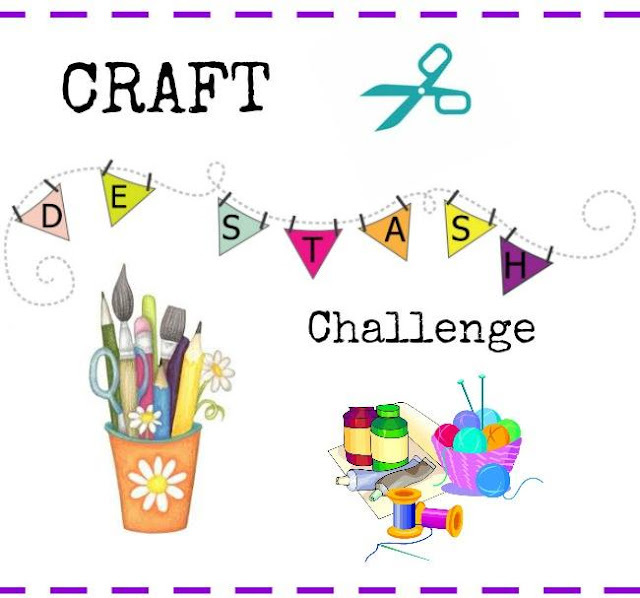 For this one, we're to create a project using only items currently found in our craft stash! Which means making something with crafty supplies or re-making an item we've been holding on to for a while. And I know we have lots of those! Looking around in my craft stash I came across a large roll of chunky yarn that I've had for awhile. I think I got it when finger knitting was so popular a few years ago. Trust me, I can't crochet or actually knit so finger knitting seems to be the only reason I have it! Let's begin by tying a 38" piece of jute twine on the ends of a 24" dowel rod. I used a command hook to hold the rod in place to make it easier to knot the yarn. Next, since I had 97 yards of this chunky yarn, I cut off 16 - five feet long strips to make what's called Lark's Head Knots. Almost every macrame piece begins with lark's head knots to hold the yarn or cording on the rod. 1. To make a lark's head knot, fold the yarn in half to form a loop on one end. Place the loop over the rod. 2. With the loop hanging down over the rod, pull the two yarn strands through the loop around the rod. 3. Pull and tighten the knot. Make 15 more lark's head knots on the rod. Next, I started tying the only knot I remembered: The Square Knot! 2. Take the left yarn strand (1) and make an L shape across the next two strands (2 & 3) and under the last yarn strand (4). 3. Take strand 4 under strands 2 & 3 up over strand 1 and out. 4. Pull strands 1 and 4 tight, moving up towards the top. Next do a reverse of the steps, starting with strand 4 to continue the look. Then group all the lark's head knots together in two's and make square knots across the entire width of rod . . .
making several rows. At this point, I really didn't have a design in mind so I began making different patterns using the same basic square knot. I wanted to add a decorative trim to the design so I decided to make handmade wire wrapped tubes out of floral wire that I also had in my stash. The wire tubes were so simple to make just by wrapping the wire around a small dowel rod to form a tube . . .
and then cutting off the excess wire. I made lots of them! Had to use a hairpin to thread the yarn through the wire tubes! I think the wire tubes add a unique look to the wall hanging! Then continued making square knots to complete the look with uneven ends. Looks good for a novice, right? How fun! I like the multi-tone yarn and the wire tubes you made. I used to do a lot macrame in the 70’s. Must be making a comeback! Fun stuff you little hippie mama. I love the yarn. Oh my this takes me back to my 20's - I love macrame. Beautiful wall hanging - pinned and shared. This does being back memories Gail. How pretty your colors are. A lovely wall hanging. Your macrame hanging looks great, Gail. I remember taking a macrame class long ago, too. I haven't tried it in ages. I never thought of using yarn for it. I want to give this a try now. What a fun project Gail! I didn't know that first knot had a name - great tutorial! Beautiful - this reminds me of the pretty macrame wall hanging my mom made when I was a kid. I love how you made tubes from wire...so creative! I'll have to put this on my craft 'to do' list. Gail, What a fun use for the chunky yarn! I have never tried macrame, but it has become quite popular again and I thought about trying a project or two with it. Love the idea of using the chunky yarn for it. Yours really turned out nicely and I love the how to on the wire tubes! Pinning. Great job--I really like the addition of the wire, Gail. My father-in-law was a railroad engineer and he did macrame to unwind after he came home from a "run". I love it! I had no idea it was so large until I saw the last photo. Great job! I love your macrame wall hanging! I've been wanting to make one for a while, but I just haven't gotten around to it yet. I love the addition of the red floral wire. Pinning! I remember the days of doing macrame! I need to get back into it, it was always such a fun craft. Loving the multi color yarn you used. Looks great Gail!